Still baking. Pretty much got it down to just my once a week routine and the occasional farmer's market. Every week I offer two varieties. One that is a levain bread and retarded in form. One that is baked in a pullman pan and cut into quarters (usually a rye). And then when I'm in the mood I'll throw in a baguette, rusitque, focaccia, or ciabatta. This week I fiddled around with my 70% Rye with Whole Wheat (http://www.thefreshloaf.com/node/40116/some-recent-bakes) to come up with a Raisin Rye. I went with a pairing of raisins, toasted sesame, and toasted fennel. A combo I've seen in levain loaves that I thought might be nice as a denser tinned loaf. I discarded the Whole Wheat for a stronger white flour and followed a Detmolder approach. The results are so very good. Plain it has a lovely tang from the staged fermentation with a lovely sweetness that cuts through from the raisins. The sesame adds a nice nuttiness and the fennel adds a lovely note. This one is in the books folks. Since I'm here this weeks levain loaf was my "Ode to Rubaud". I've read much about him, watched the youtube videos, and gave his formula a go some time ago. My results were good but not great. I needed to adjust my approach as I retard in form and he does not. 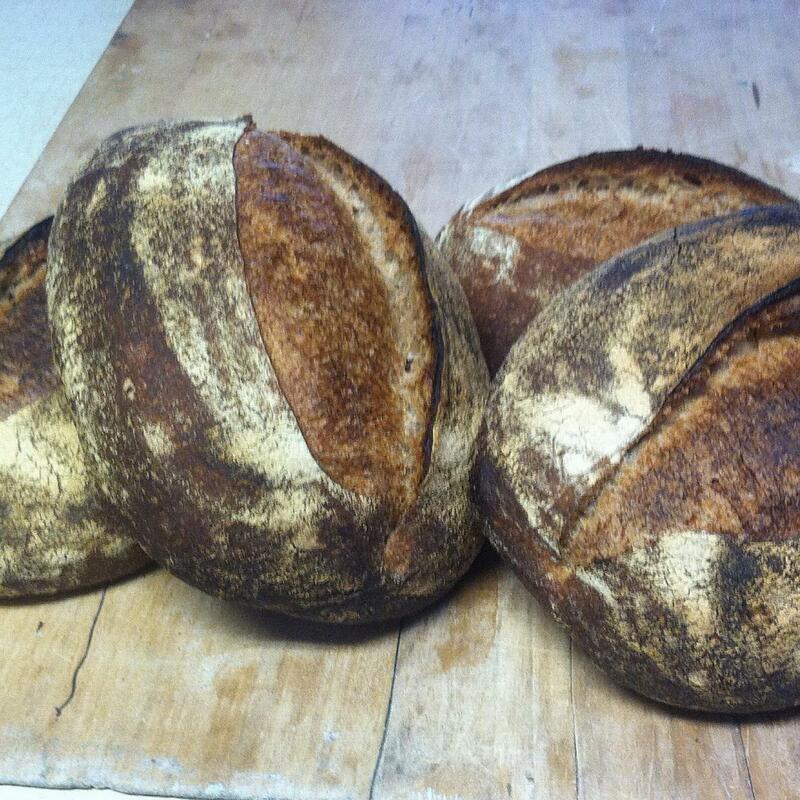 My take is more focused on the blend of fresh milled flours and the three build levain.. This time around I decreased my PF from 15% to 13%, added an extended autolyse (4 hours). I got pretty good results but they may be a tad over fermented. The lovely three build levain and extended autolyse makes this loaf mildly acidic, sweet, and earthy from the fresh whole grains. I'll come back to this one soon to find the proper timing. WOW... The raisin rye is gorgeous! 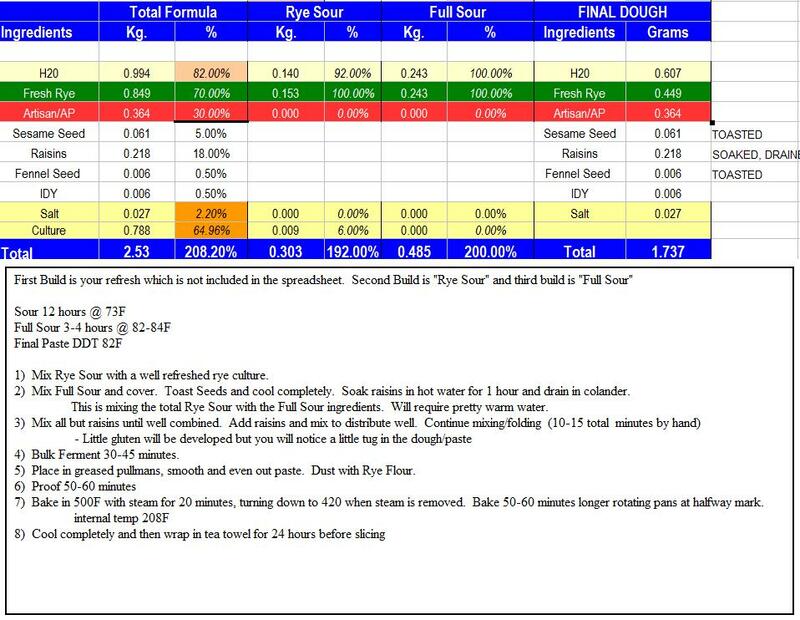 I see on your formula that you soaked the raisins. Can you explain a little about that process? I haven't experimented with any raisin breads yet, but I've read about several different methods on soaking raisins. I also want to know if there's any distinct differences between soaking them in water, rum, cider, juices, etc, if you have any experiences or knowledge on that. I soak the raisins in warm water for an hour to "plump them" and then drain in a colander to get rid of all excess. This way I don't have to adjust my hydration for the dough/paste. Yes you can soak your raisins in a variety of ways. I do this for my stollen. You could also add citrus peel to the soaker or vanilla bean and infuse the raisins (or other dried fruit) . Rum Raisin Rye. You might be on to the next incarnation. But that'll kick the cost up a bit. That Raisin rye with fenel looks gorgeous! Well done Josh. I should try your recipe soon, thanks for sharing. The Rebaud loaves are just outstanding. You should try it Khalid. I've fixed up the formula and tried to make it a bit more clear. Look forward to see your results. Josh - just love that raisin rye, it must taste fantastic with the fennel and sesames - a really interesting mix of different flavours. I really like the flavour of the Rubaud mix of flours, I made it once and didn't get anything near the beauties you've turned out but the taste is wonderful. I'll be watching out for your results on the timing of those. Thanks. The raisin rye is really a treat to eat. Once smeared with butter it tastes like a sweet bread but no sugar in the dough. 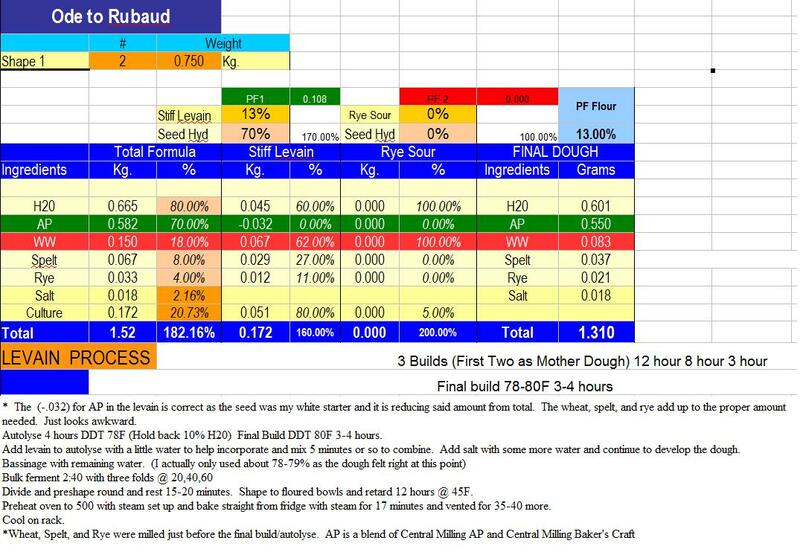 Keep in mind if you really want to follow suit with Rubaud you'd do your final proof at room temp and it would be relatively quick with the fresh flours. My DDT this go was 79F and I suspect it would have been ready to bake in 1:30 or maybe even less if done at room temp (76-80F with the oven cranked up). This time my bulk was 2:45 minutes with 3 folds @ 20,40,60 minutes. Final proof in the fridge was 12 hours and they sprang quite well in the oven but were very well proofed. A touch less may have had them stand a bit taller. Much better than my first go at this one though. The flavor is wonderful. Happy baking - its almost stollen time if you want them aged! I must have hit something in the spreadsheet that tweaked the numbers. I got a new screen shot and updated the instructions in a better font as well. I'm sure you recall my search for spreadsheets to use. I looked through oodles and oodles of them. Some too simple, some way to complex (BBGA). I found one that looked great and it became my template. From them I've learned how to write via spreadsheet. It's far from perfect and has a few quirks but I know them and it does me justice. It's still just a template that I'm constantly improving. I don't include the refresh stage in the spreadsheet since I feed my starters 2x a day I always have it on hand. I maintain my rye starter at 1:10:10 (seed:flour:h20) and I use whole rye. From that I make the 12 hour sour. The total of that is combined with the ingredients in the Full Sour row to become the "Full Sour". thanks Josh. I'm always having to fix errors in my sreadsheet - goes with the territory. Now how about a rformula for the Rubaud.? First off I final proof cold. I've decreased PF from 15% my first go to 13% this go and I may drop down to 12% next go. Rubaud uses a blend of 70% AP and 30% ww, spelt, and rye as shown above. Or at least something close to that. He feeds the levain with the same proportion as final mix. I opted to make the levain with just the whole grain mix this time around but keep the overall flour blend the same. but... the compacted portion of the crumb near the bottom is screaming out a warning (to me) that it is just a little bit over proofed or over kneaded/mixed. You know your equip better than I. The 10 to 15 minutes of stirring in the ingredients is what I'm concerned about. The higher the rye% the less it should be stirred and worked. See if you can shorten it or make it more gentle. Try wetting the wheat and developing it partially before adding to the big mix. Add raisins with as little mixing as possible. Another idea might be to shorten the bulk ferment turning it into 10 minute rest or skip it putting the dough into the pans sooner. I've wondered the same thing. They say to mix in a machine for 10 minutes on speed one so i figured hand mixing would should be at least the same if not more. I thought about autolysing the white flour but opted to pass. I think I'll just add all at the start of the mix and mix less overall. If I skip/shorten the bulk ferment I'd assume the final proof would be a touch longer? I'll try less mixing on my next rye bake and see if it helps the overall crumb structure. Thanks. Constructive criticism is more than welcome. And I too noticed the crumb but haven't quite figured where I've gone awry (haha). It's eating quality is still fantastic so it leads me to believe I'm slightly over proofed. My 10-15 minutes of hand mixing this thick paste (slower than a machine on speed 1) I can't imagine being too much. i think I need to shorten proof times which was Mini's other solution. That is the one I'm gonna go with. I'm just gonna shorten the bulk to 15 minutes while I prep the pans and my space. Both loaves look super good to me. I find I can always find something about my loaves I can improve on which makes it fun. What kind of oven are you baking your breads in? You certainly achieved a perfect crust that's for sure. I bake in a cheapo home gas oven with two 20x15x1" kiln stones I had cut for me. Underneath is a tray of lava rocks and a brownie pan of steam towels. steam towels in 20 minutes before load. Water on rocks right after load. As I said earlier constructive criticism is always welcome. My rye loaves have been really well received but I do know they can get even better. This also pushes me to believe it's just slight over proof as the entire texture isn't blemished which if the paste was over mixed I think would be the case. just slightly over proofed. If I see compacted crumb, I look very closely at the bubble formation of the crumb following it up, the way bubbles rise. Especially near the top about the same distance down as the compacted crumb up, they have about the same inside loaf temperature. Bubbles get more irregular as the matrix breaks down, as bubbles break into each other to form bigger bubbles. 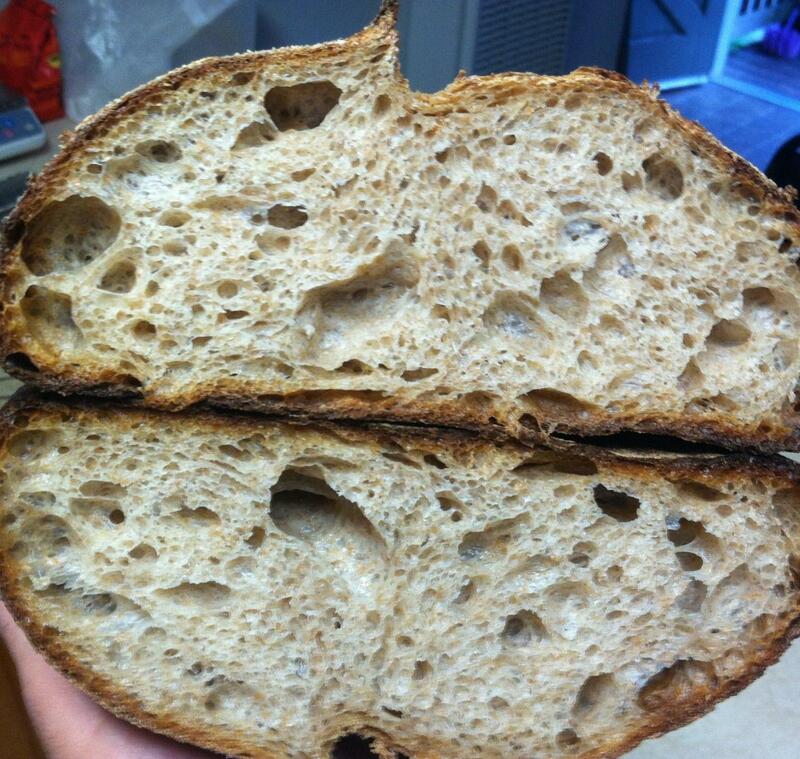 Heat sets the crumb but if the fermenting continues and goes too long, the interior weight can no longer hold itself as the matrix breaks down releasing gas (goes up) and starts to fall and compact in the lower crumb. Extreme would be irregular horizontal caverns from displacement under a set crust and solid areas of compacted crumb. The fragile rye matrix can also run into problems if formed to trap gas and then handled too far into fermentation. Either by you or the yeast, the suddenly active IDY stretching the dough too fast. That is why I stopped using IDY with my high rye sourdough. The starter was powerful enough and the added yeast did a good job of wrecking my loaves. So I stopped using it. You can also see if reducing the amount of yeast is the only tweak you need to do if you like the way the process is timed. Thanks for the advice Mini. I use the added IDY as my space doesn't keep to a current temp and it gives me better predictability. I could adjust this down to keep the paste from running away on me. I may try this and see if i can get my timing down better. What are the benefits of giving this type of paste a bulk ferment anyway? It's so short there isn't much time to develop flavor. Maybe skipping this stage will also help so i don't handle the paste too far along. I've bee trying to figure how how much pre-fermented flour is in the dough at mixing time. It looks close to half or more so no bulk rise is needed if you ask me. The concept of the rye is amazing. I have never made a rye with dried fruit and fennel. Those play nicely together. Why not in rye? I was thinking about a rye for my next bake. I'm inspired!